My motherboard reviews over the past few months have almost solely been of high-grade enthusiast products from various brands. There are a lot of board options for those looking to spend $200 or more, and I will cover more of those soon, but there are just as many options if you want to spend a bit less. Gigabyte was one of the first to send me such a relatively inexpensive board option focusing on basic functionality with a few additional things thrown into the mix for good measure. Gigabyte has been around for a long, long time, and their years of experience in designing board products and other consumer-grade devices give them a level of expertise that might be overlooked by some. In an effort to solidify their product offering and deliver clear and concise design choices catering to certain users, Gigabyte has now launched a whole new esthetic design with their Z87-based product lines. Each Z87 product features a different color to separate it and its functionality from all the other Gigabyte boards. Many recognize Gigabyte's orange-themed OC products, and we now have gold, red, black, and blue boards following the same pattern. 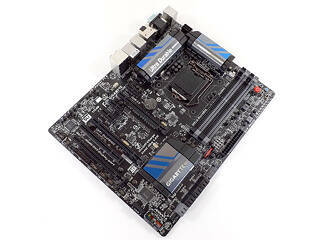 The blue board, the Gigabyte Z78X-UD3H, is an entry board for enthusiasts. Purpose-built to provide a strong, stable computing platform to all users, including gamers who like a slight overclock, it is very much a "sand-bagging" board to me, a board built with many enthusiast OC features that come together to give very decent long-term overclockabilty. None of its overclocking features are actually advertised, but Gigabyte's UD3H boards have been hidden overclocking gems for many generations now. One key indicator of the Gigabyte Z87X-UD3H not exactly being what it appears to be is in the bottom PCIe slot; it is connected to the Z87 PCH. Add in its minimalistic esthetic design with just a few slashes of color and the Gigabyte Z87X-UD3H really is "The Sleeper".